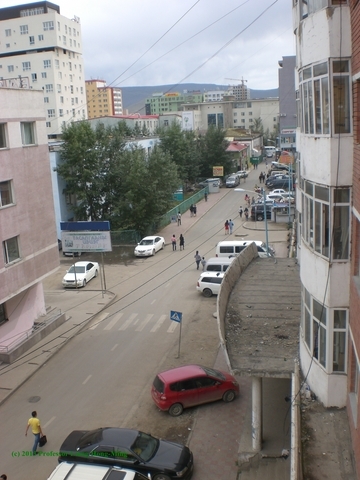 During my first three weeks as a teacher in Ulaanbaatar, Mongolia, I’ve done more reminiscing on my high school and middle school years than I ever have in my life. This is because I’m realizing that no matter how mature I thought I was as a student, I never could have understood the daily joys and frustrations of my former teachers as I am beginning to understand them now. Like how infuriating it is to see a spitball fly across the room out of the corner of your eye. (Yes, one of my university students did that.) Or how touching it is the first time you successfully coax a very quiet student to raise her hand and give the correct answer (I was that student once…). Or how disappointing it is when you enter the classroom feeling completely prepared but then forget one simple thing (like a piece of chalk) which throws your whole lesson off. Or how encouraging it is to have one student stop and say, “that was a good lesson” or “thank you, teacher” on their way out the door (which has also happened, fortunately). At times like these, I think back to my high school and middle school classmates — the ones that always blurted out the answers first, the ones who never said a word, the ones who made it their mission to cause as much trouble as possible, the ones who used everything from their socks to their pencil cases to express their individuality…and I see these classmates in the students I teach now, all the way across the world and a number of years later. In a way it softens my heart (even though it can also frustrate me) to see just how similar my students’ world is to the world in which I too have been a student. I also think back to the teachers I had — Mr. Johnson, who tried to be everyone’s friend, Ms. Barrett, who sometimes snapped, Mr. Stevenson, who took everything too seriously, Mrs. Lee, who no one ever took seriously…and I feel like I’ve somehow turned into a strange mixture of all of them in a matter of just a few weeks. I see each of them in a more forgiving and sympathetic light as I fumble around in the career they have courageously dedicated their lives to. Another insight I’ve gained is that teaching can be a lot like acting. I’ve heard this said before, but it didn’t make sense until I actually started teaching. These days I do often feel like an actor, trying to develop stage presence with each group of my students. Taking the stage at the front of the classroom can feel as intimating as the opening night of Hamlet, and as I glance forgetfully at my not-always-helpful lesson plans, I often feel like I’m fumbling through my lines at an audition for a cheesy commercial that I barely have a chance at. Besides learning a bit about acting and a bit about the experiences of my former teachers, however, what I’ve learned the most of during my first three weeks as a teacher is improvisation. During my very first class, I discovered that none of my students had the textbook which I had based the entire lesson upon and which I’d been told they would have. Then during the very first class of another course I teach, the power went out, which was problematic because that entire lesson was on the power point which I could no longer project onto my students’ whiteboard. Then of course the students always surprise me, such as when they blurted out on Day One: “Teacher, how old are you?” Are you married?” Then there’s the fact that I can only speak a few words of the language my students all mastered as children, and their ability to speak English is, well, all over the board. In my opinion, however, each one of these challenges and surprises only does me good. Each complication is an opportunity for me to learn to be more flexible, yet to also maintain a necessary amount of structure and control. As I become more flexible, I think it should become easier for me to be successful not only in the classroom, but in this country — both very unpredictable places. And outside of the classroom, these situations are a great introduction to the “real world” that I entered when I graduated from college. After all, Mongolia isn’t the only unpredictable place in the world; life everywhere, for everyone, is full of surprises. And the more that surprises me, the better, because each one improves my ability to respond the only way we often can in the “real world”: by improvising. The North Star Project: Collaboration between The Middle Ground Journal Student Interns, The College of St. Scholastica, and North Star Academy 8th Grade Global Studies Classes, 2013-2014 School Year Reports. (c) 2013 The Middle Ground Journal, Number 7, Fall, 2013. See Submission Guidelines page for the journal’s not-for-profit educational open-access policy. I thought you had a great story. I could only imagine realizing what your teachers went through and finally seeing their side of teaching. Also,I bet making that connection/comparison with the kids you were teaching to the kids that were in your class when you were younger was pretty weird at first. Sounds like a good experiece overall, thanks for sharing! Its really nice that students abroad all face the same problems like being shy. Relating yourself to your students is probably one of the greatest things I’ve heard about teaching, I will certainly remember this article if I ever teach! I learned a lot of about teaching from you, thanks! This was a great article to read. I loved how you pointed out the similarities in teaching and students even though you are not in the same place as when you got an education. You mentioned some of your teachers and I was wondering if one of them had a large impact on you deciding to teach as an occupation? Or on your decision to teach in a different country? It’s crazy to think that no matter where you are in the world, children are children and are often strikingly similar. This is a beautiful article and I enjoyed it a lot (probably because I am a future educator). I also totally get the need to improvise. During the few lessons I have taught, everything does not go according to plan and things need to be switched around and change. Teachers have to adapt lessons quickly to get to the main point of a lesson. I can not even imagine having to improvise in a foreign country. Great story! I really enjoyed reading your comparison of teaching in front of a classroom to the opening night of Hamlet. I can’t imagine how difficult yet rewarding it must be to teach in another country. Great article! It was nice when you said how you finally understood your teachers when you were in school. I liked how you talk about having to improvise several times, since that is something we need to do in many situations. What a great opportunity you have by teaching in another country. I enjoy the parallels you draw between teachers experiences across the globe. I come from a large family of teachers and I am sure they have experienced your pain, just not in Mongolia. This piece really shows me the similarities between people all over the place. Students in the U.S. or Mongolia all act silly, and dumb sometimes, and ask questions about their teacher and react differently. The acting teachers have to do in front of each groups of students seems to also transcend national borders. Thank you for this piece! Nice job Gina! It is really interesting seeing things from the teacher’s perspective. I will make sure to say thank you to my teachers from now on. It was good to see some of the struggles that a teacher could go through. Also, what I find to be really awesome is the similarities that students express internationally. It is nice to know that it is not just most American students who are aloof.